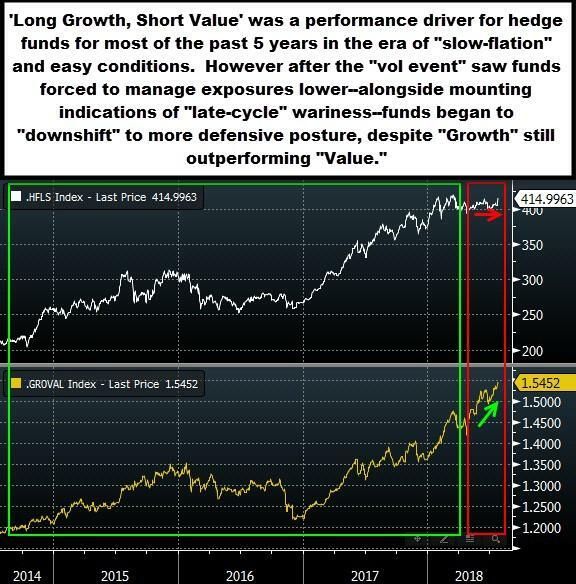 Nomura's head of cross-asset strategy Charlie McElligott writes today that he is seeing heightened equity fund manager consternation right now, as there are indications of potential catalysts on the horizon for a reversal of what has been the most important trade of the past 11 years - “growth over value” - with the recent breakdowns in FB, NFLX, TWTR further contributing. Why are they concerned? Because consensual “long growth, short value” positioning has dictated performance over the past few years, and with it, this portfolio construct became “momentum” as well. 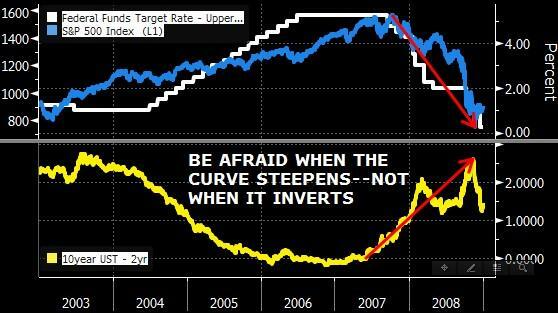 steepening of yield curve, as tighter financial conditions begin to drag the real economy and ultimately force the market to remove Fed hikes currently priced-into the front-end. 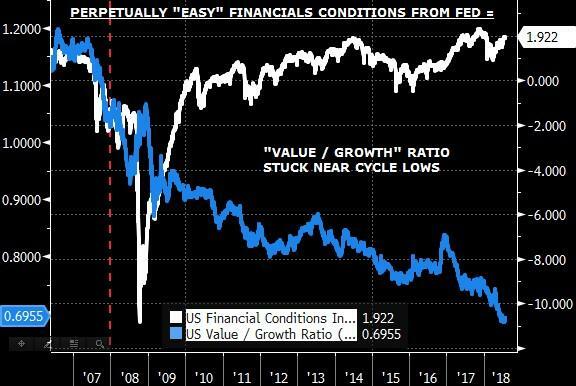 On the surface, this is equities-centric message…but the truth is that the subject matter that is the “Growth over Value” stock phenomenon since 2007 has major macro inputs, and significant read-throughs for both broad risk-asset sentiment and larger regime- / rotation- / performance- implications. Yesterday in maximum “un-shocking” fashion, the Facebook blowup and its implications on crowded “Growth” factor trades (alongside the NXPI / QCOM deal “nuking” to a lesser-extent) caused meaningful performance ripples across equities books, and largely wiped-out all of the outsized gains from Wednesday’s U.S. / E.U.“Art of the Deal Truce” extravaganza. Luckily for the masses, after the close we saw another “growth” poster –child—AMZN—ride to the rescue. First, a bit more granularity on why one stock (FB) could matter so much: FB is also in some 200 different indices (! 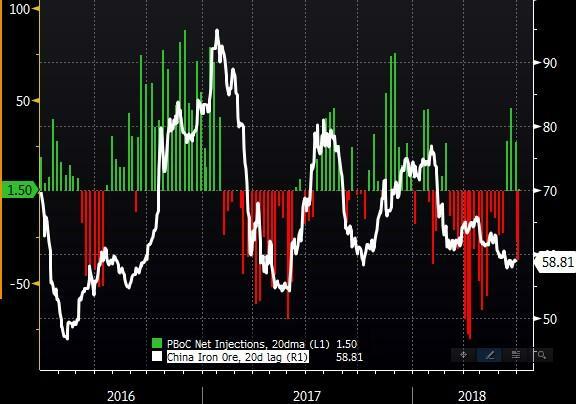 ), ranging from “Growth”- / Tech- / FAANG- related ones (Tech is, after all, a 41% weighting in the S&P 500 Growth Index)…to somehow, “Low Volatility-,” “Low Beta-” and even “Value-” indices as well. PASSIVE AT ITS VERY WORST, the definition of “crowding” as it’s simply “everywhere” and thus has such an outsized impact (it also had 91% of analysts at a “Buy / Outperform” rating going into the EPS print). For the quants, FB is in our ‘Sales Growth’ factor (long leg), the top performing “Growth” category YTD—as well as our ‘5Y EPS Growth’ factor long leg, ‘Operating Leverage’ factor long leg, our ‘Analyst Coverage’ factor long leg and the ‘Cash / Assets’ factor long leg…with the majority of these factors at the top of the past year’s factor category performance table. Bottom-line, FB is / was the most widely held overall Hedge Fund stock, as well as the most frequent top 10 HF holding, per competitor PB data. But why is “everybody” parked in “growth” in the first-place? This only further concentrates as “Tech” and “Consumer Discretionary” (think FANG+) sectors by themselves make up a collective 44% of our “Sales Growth” longs basket and 47% of our “5Y EPS Growth” longs basket. So then should it be any surprise that these same two “growth” sectors then make up 51% of our “1Y Momentum” longs basket? So this is the question: “what will it take for “Value” to work again / reverse the trend since 2007 vs “Growth?”—an outright existential one for an entire style of investing which, historically, has generated superior returns vs Growth historically (per the work of Fama and French). So what could cause this reversal to finally occur and drive an actually rotation into “cheap” and out of “expensive” within Equities? The cross-asset implications are potentially enormous, as the “consumption power” within Chinese fiscal stimulus / infrastructure fixed-asset investment growth projects has previously shown the ability to single-handedly reset the Commodities complex “higher”—and with it, global inflation expectations (as critical price-drivers in long-term macro factor regimes throughout fixed income, equities and currencies). This matters to “Value” because again, it’s the “cyclically-geared” stuff which has lagged the “secular growth” stuff since the crisis. 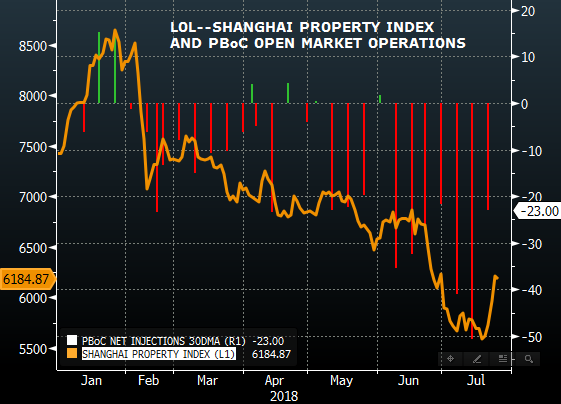 If China can “reflate the world” those “cyclicals” are gonna get hot again. 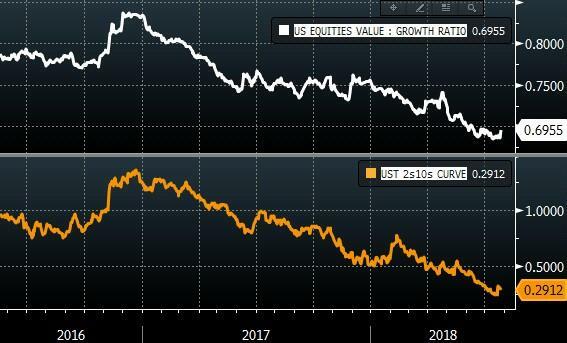 This is why we’ve continued to push UST 2s10s / 5s30s “curve caps” trades with anywhere from 1y to 3y expiry, as this “late-cycle” economy into rapidly-tightening financial conditions (ESPECIALLY WITH USD STRENGTH NOW AS TAILWIND) inevitably means that growth downside vs upside is skewed from here out. It’s the perfect hedge. The same flattening impetus in the market (beyond the pension fund de-risking and tax reform catalysts) of “above-trend growth and inflation” which forced a skeptical market to “come to terms” with the Fed’s dots and consistently add hikes to the front-end for the last year—will have to be reversed out, as “slowing” will see hikes removed when markets “sniff” the slowdown. Hikes removed from front-end means those yields readjust lower VIOLENTLY, in light of the scale of the short there. Remember that Friday / Monday curve steepening (via the BoJ) alongside the Chinese stimulus escalation start of week? 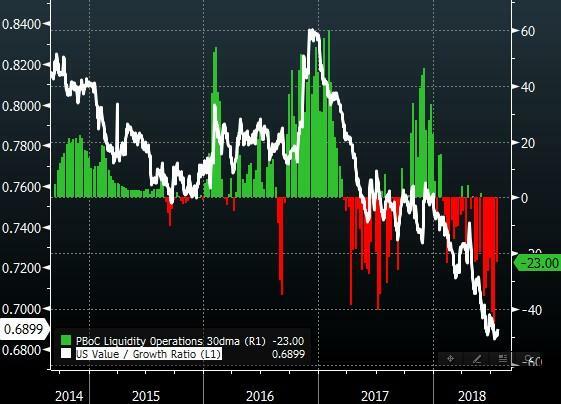 THAT was why we saw that lumpy “quant factor reversal” that I wrote about Tuesday night (“THE QUIETEST EQUITIES FACTOR ROTATION YOU’LL EVER SEE”). That COULD be a look at the future state in a year’s-time.